Much has been written about Christian initiation, but most of it is written from the perspective of the large urban or suburban parish. People in rural areas and small towns live in a culture different from those in cities and suburbs, and the ministry to catechumens and candidates should reflect those differences. 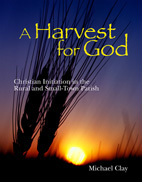 In A Harvest for God: Christian Initiation in the Rural and Small-Town Parish Michael Clay offers practical, step-by-step insights into implementing the Rite of Christian Initiation of Adults in a way that is faithful to the rite and respectful of rural culture. Anyone who ministers in a rural or small-town catechumenate will find this book a valuable aid in their work. Michael Clay is a priest of the diocese of Raleigh, North Carolina. He has been involved with the implementation of Christian initiation since 1980 in parish, diocesan, seminary and national settings and has worked with the North American Forum on the Catechumenate in the development of initiation institutes for rural and small-town ministers. He holds a doctorate in liturgical studies from the Catholic University of America, in Washington, DC.